A white and gold wedding colour scheme is simple and very elegant. You can either go glam with these colours or aim for a more rustic look. I’ve put together just a few ideas to help you design your white and gold wedding. This is one of my latest designs and uses a very simple clean white and dark grey layout with a nice elegant font. It is then finished with a spatter of antique gold paint and stripey gold and white string. The full stationery suite is available with this design so can be used on your wedding day to complement your colour scheme. Find out more about my simple gold wedding stationery. This white and gold floral centrepiece has a lovely rustic and relaxed feel to it. 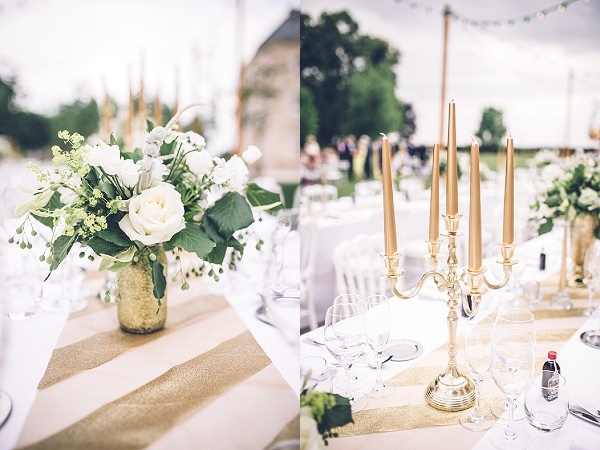 I really like the striped gold table runner in this image. This dress is absolutely stunning. It maintains the traditional feel of a simple white dress but the dipped gold hem gives it a modern, glamorous feel without being too over the top. 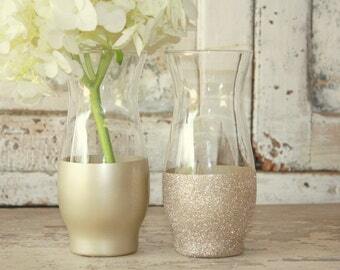 The gold dipped vases look great and quite an easy, budget way to add gold to your styling. The pretty, gold confetti style cake shown would tie in nicely with my simple gold wedding stationery. I really quite like these wedding shoes. 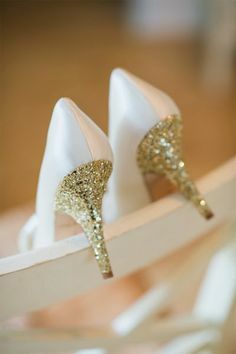 A nice subtle addition of gold glitter to an otherwise simple white wedding shoe. I also like these glitter, gold dipped feathers and they’re incredibly easy to make yourself. You could hang them to make a lovely feature or use them on your tables with the favours or napkins. Or maybe even use them with your cake decoration somehow. This floral bouquet uses gold tones amongst the white flowers and looks lovely and subtle. It would look great for a more rustic white and gold wedding.